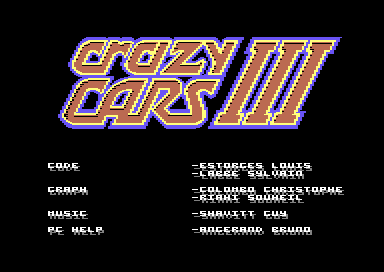 Indie Retro News: Crazy Cars 3 - Interesting C64 EasyFlash release from Excess... 25 years later. Crazy Cars 3 - Interesting C64 EasyFlash release from Excess... 25 years later. 1992 was a depressing year for C64 owners... Their friends were beating the crap out of each other in arcade perfect ports of Street Fighter 2 and Mortal Kombat on the SNES. Their other friends were playing Co-op multiplayer Alien Breed on the Amiga, and their other friends were zipping through blazing fast platforming nirvana in Sonic on the Megadrive. But hey it wasn't all bad... at least we didn't have PCs with CGA purple graphics and bloopy motherboard noises. Releases were still being produced for the now decade old 8 bit microcomputer, like this one from Titus Software, continuing their original Lamborghini Diablo racing franchise. But I guess by this point all the best developers had moved onto bigger things, as the C64 port for Crazy Cars 3, was quite frankly as dull as dishwater. This hilarious Zzap / Commodore Force review from issue #92 sums it up brilliantly. Excess having "cracked" the disk version of the game in 1992, have put out another release titled: Crazy Cars 3 Arcade (easyflash) version. This is the first release of the cassette version, which deals with problems with the tape's multiload system, fixes a few other bugs, adds a trainer, and includes full game documentation. And as the title suggests, will work on any easyflash compatible cartridge setup. 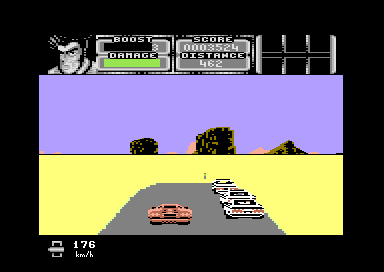 Basically this is a bog standard racer, with very little variety between levels, and almost all of the unique features of the 16 bit variants missing. 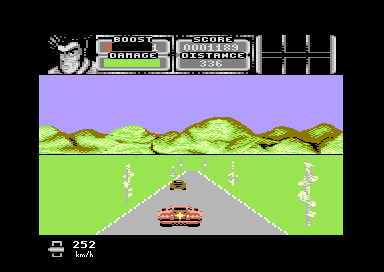 It's not the worst racer on C64: the tracks are lengthy and it is a challenge beating your rivals to the finish. The feeling of speed is present, and ramming enemies off to the side of the track when using the turbo can be fun. It's definitely worth a few goes if you've never played it. And those of you who kept your C64s until 2018? You're having the last laugh.. How many Megadrive games got released so far this year?